Mother's Day is a time to honor the most beautiful human being in your life - the one who raised you, loved you, sacrificed countless sacrifices for you... and probably still tells you what to do on occasion, since old habits die hard! Let her know you love her with a bouquet of flowers that well describe the beautiful soul that is your mother. Just because it's the perfect season for beautiful flowers, tell her that you love her. Any excuse will do. A birthday arrangement should be bright and reflect the personality of the person whose day is being celebrated. Whether the loved one is spunky, graceful, a constant source of encouragement to those who know her, or tireless in her daily acts of courage and kindness, flowers have the spectacular ability to acknowledge happy returns for all sorts of personalities. Whether it's a boy or a girl, flowers are like fireworks when celebrating a new life that has come into the world. Tell the new mother congratulations with a joyful arrangement. Perfect in their botanical design, over time roses unfold from bud to flower, revealing layers of gem-like petals in shades of ruby and garnet. Tell the lady you love that the years have only deepened your admiration for her heart and mind, broadened your perspective to seeing her beauty within and without, and heightened your love for her in ways you had never known possible. It is hard to put that kind of love into words, but roses are unique in their ability to translate it well.. Insider secret: when you buy the flower arrangement at the grocery store on the way home, the lady knows it. She will likely be appreciative of the gesture, of course, but think how much more she will melt with an arrangment that is deliberately thought through. Her favorite flowers, her favorite colors...presented in a custom container that lets her know that this was no afterthought. Good deeds are like flowers: they are more than just beautiful in themselves, they develop seeds of kindness that propagate the species, leading to a whole field full of appreciated acts of love. 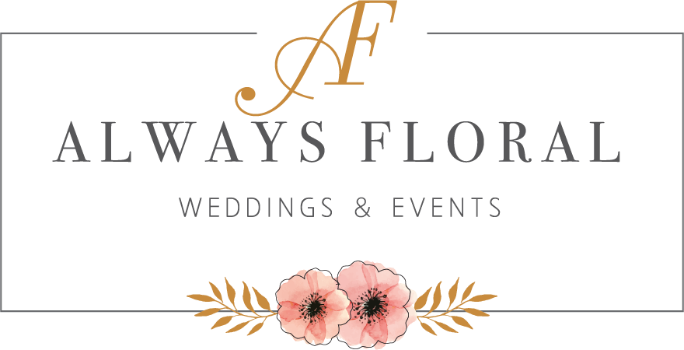 Say Thank You with a special floral arrangement from Always Floral. Good spirits is good medicine for the sick friend or loved one. Put a smile on their face with a beautiful, personalized arrangement of their favorites varieties. Beautiful arrangements for funerals, memorial services and graveside rites. In loving memory.